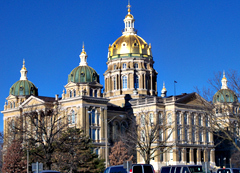 Republicans in the Iowa House have approved bills that would provide a two percent increase in state “per pupil” spending for Iowa’s public schools for the 2016/2017 school year. “I think this is fair,” said Representative Chuck Soderberg, a Republican from Le Mars who is chairman of the House Appropriations Committee. Democrats raised a host of objections and suggested it would be best for the legislature to first settle the debate over state funding for the school year that begins this August. Representative Patti Ruff, a Democrat from McGregor, said Republicans should be “ashamed” of proposing a two percent boost for schools. Republicans say it’s difficult to make the decision now since there’s no reliable prediction yet of what state tax revenues might be next year. Senate Democratic Leader Mike Gronstal said on Monday that Democrats believe the two percent increase for schools in the next academic year is inadequate. “We think K-12 education is the single-most important thing that state government does,” Gronstal told reporters. House Speaker Kraig Paulsen, a Republican from Hiawatha, today said he hopes Democrats change their minds, but he’s not willing to hold up the conclusion of the 2015 legislative session until this decision on next year’s state aid for schools is made. Negotiators are still working on the budget bill that should include the tentative deal for how much state support schools will get for the 2015/2016 school year.